Pigment PR214 is a semi-opaque dark reddish pigment with moderate tinting strength. 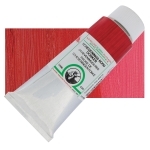 Pigment PR214 has very good lightfastness for an organic red pigment. Pigment PR214 is not considered toxic. The disazo condensation pigments are a related group of disazo pigments that range from yellow to reddish brown. A technique for producing disazo condensation pigments was developed by CIBA in 1951.